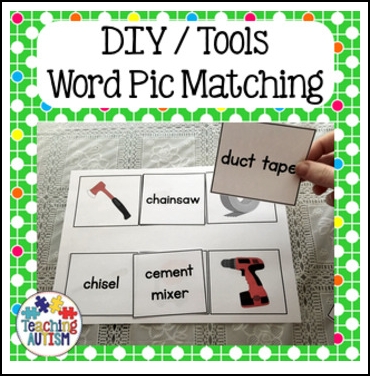 The word to picture matching activities are a fantastic resource for any classroom, although especially with non-verbal students. It can help to encourage and promote reading and recognition of vocabulary and different items that are related to the theme of DIY / Tools. This resource is a great strategy to encourage students to read the words that they can see, but also to be able to understand that they can link the word to an actual image/item. Many students may learn to just read words but not understand the meaning behind them, this will help to work with students on working towards achieving this skill. Instructions on first page of how you can use this resource to it's best potential within your classroom. This resource will be great for group work, speech sessions, 1:1 activities. english/literacy sessions, vocabulary work. This contains 2 different activities. All vocabulary linked to DIY / Tools.